RP Photonics has the powerful RP Coating software for designing dielectric mirrors of any type. See the diagrams in this article or the case studies. A Bragg mirror (also called distributed Bragg reflector) is a mirror structure which consists of an alternating sequence of layers of two different optical materials. The most frequently used design is that of a quarter-wave mirror, where each optical layer thickness corresponding to one quarter of the wavelength for which the mirror is designed. The latter condition holds for normal incidence; if the mirror is designed for larger angles of incidence, accordingly thicker layers are needed. The principle of operation can be understood as follows. Each interface between the two materials contributes a Fresnel reflection. For the design wavelength, the optical path length difference between reflections from subsequent interfaces is half the wavelength; in addition, the amplitude reflection coefficients for the interfaces have alternating signs. Therefore, all reflected components from the interfaces interfere constructively, which results in a strong reflection. The reflectivity (reflectance) achieved is determined by the number of layer pairs and by the refractive index contrast between the layer materials. The reflection bandwidth is determined mainly by the index contrast. Figure 1 shows the field penetration into a Bragg mirror made of eight layer pairs of TiO2 and SiO2. The blue curve shows the intensity distribution of a wave with the design wavelength of 1000 nm, incident from the right-hand side. Note that the intensity is oscillating outside the mirror due to the interference of the counterpropagating waves. 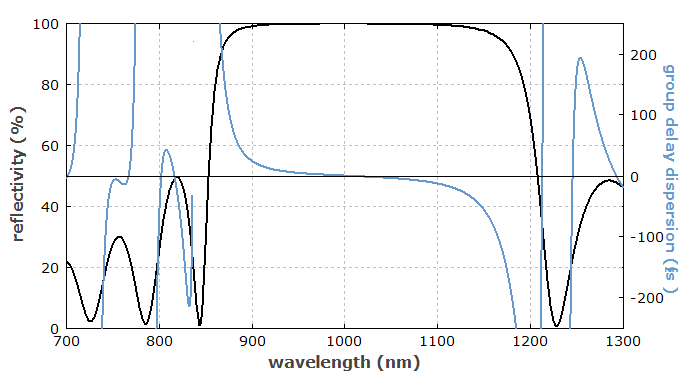 The gray curve shows the intensity distribution for 800 nm, where a significant part of the light can get through the mirror coating. Figure 1: Field penetration into a Bragg mirror, calculated with the software RP Coating. Figure 2 shows the reflectivity and the group delay dispersion as functions of the wavelength. The reflectivity is high over some optical bandwidth, which depends on the refractive index contrast of the materials used and on the number of layer pairs. The dispersion is calculated from the second derivative of the reflection phase with respect to the optical frequency. It is small near the center of the reflection band, but grows rapidly near the edges. Figure 2: Reflectivity (black curve) and chromatic dispersion (blue curve) of the same mirror as above. Figure 3 shows with a color scale how the optical field penetrates into the mirror. It can be seen that there is little field penetration well within the reflection band. 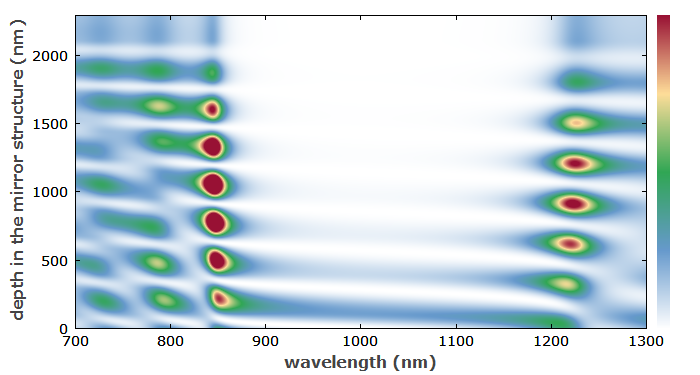 Figure 3: Field penetration into the Bragg mirror as a function of wavelength. The colors indicate the optical intensity inside the mirror. 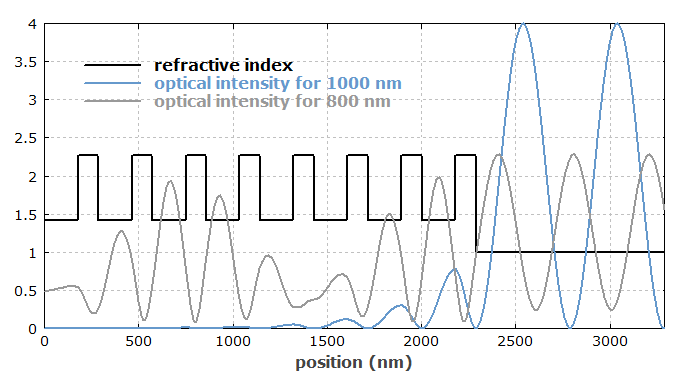 Figure 4 shows reflectivity spectra of a Bragg mirror for different angles of incidence. The larger that angle, the more the reflection spectrum is shifted towards shorter wavelengths. 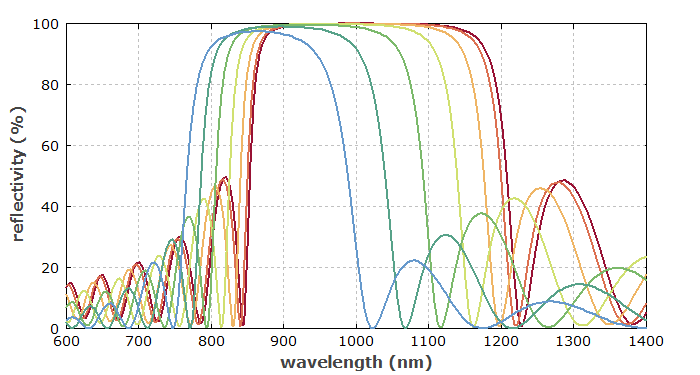 Figure 4: The reflectivity spectrum of a Bragg mirror for different incidence angles from normal incidence (red) up to 60° (blue) in steps of 10°. Dielectric mirrors based on thin-film coating technology, fabricated for example with electron beam evaporation or with ion beam sputtering, are used as laser mirrors in solid-state bulk lasers. The mirror structure then consists of amorphous materials. Fiber Bragg gratings, including long-period fiber gratings, are often used in fiber lasers and other fiber devices. They can be fabricated by irradiating a fiber with spatially patterned ultraviolet light. Similarly, volume Bragg gratings can be made in photosensitive bulk glass. Semiconductor Bragg mirrors can be produced with lithographic methods. They are used, for example, in surface-emitting semiconductor lasers and in semiconductor saturable absorber mirrors, but also as separate optical components (→ crystalline mirrors). There are various types of Bragg reflectors used in other waveguides, based on, e.g., corrugated waveguide structures which can be fabricated via lithography. Such kind of gratings are used in some distributed Bragg reflector or distributed feedback laser diodes. There are other multilayer mirror designs which deviate from the simple quarter-wave design. They generally have a lower reflectivity for the same number of layers, but can be optimized e.g. as dichroic mirrors or as dispersive chirped mirrors for dispersion compensation.